Great news out of American Express today! Great news from American Express today! We finally see a transfer bonus from Membership Rewards to British Airways Executive Club. Until Sep 30 you'll receive 1.25 Avios for every 1 Membership Rewards point. This isn't like the 50% bonus we've seen from years past but something tells me there is a glut of Membership Rewards points sitting in people's accounts right now who have just been waiting for this bonus. I would also wager a guess a lot of those points come from the American Express refer a friend program. If it wasn't for the American Express referral bonus there would be a lot less frequent flyer blogs, travel and financial blogs delving into the loyalty space in Canada right now and less people promoting the cards in their signatures on forums. So while some might whine that the bonus is only 25% I look at it this way: without the referral bonus, perhaps you would only have 50,000 Membership Rewards Points to transfer and if the bonus was 50% you'd get 75,000 Avios. However because you've referred 5 friends since the last transfer bonus in 2013, you actually have 100,000 or more points to transfer for at least 125,000 Avios so you've come out ahead in the end. I am in this boat, I've refer a few people each month (1 referral in June 2015) but contrary to some who ask, I don't get very many through Rewards Canada as we have marketing agreements with American Express that preclude continuous use of the referral links. Unfortunately some of you may not have referred friends or are new cardholders (but you can before Sep 30!) so ultimately you are getting less compared to the last bonus but be thankful they are even running the bonus and the fact that Amex has kept the base transfer at 1:1 and not followed their American counterparts by lowering it to 5:4! You can find out more about the current transfer bonus here. Other news from American Express sees another exclusive bonus for those who hold an American Express AeroplanPlus card. The last bonus was for Fairmont stays and now this one is for flights on Air Canada to Las Vegas, Honolulu or Maui. 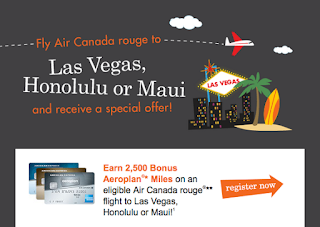 Earn 2,500 Bonus Aeroplan Miles on a flight operated by Air Canada rouge between Canada and Las Vegas, Honolulu or Maui for travel by September 30, 2015, on Tango, Flex, Latitude, or Premium rouge fares. Simply register using your Aeroplan number associated with your American Express® AeroplanPlus®* Card and book your eligible round-trip (or 2 one-way segments) between June 26 and July 16, 2015, using your American Express AeroplanPlus Card at checkout. At time of booking, when prompted, you must provide your Aeroplan number that you provided during registration. 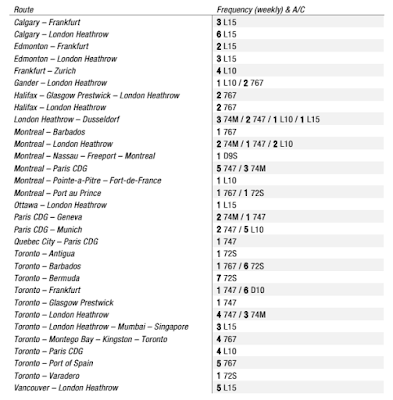 Not really news but we found a flashback post from Airlineroute.net interesting! 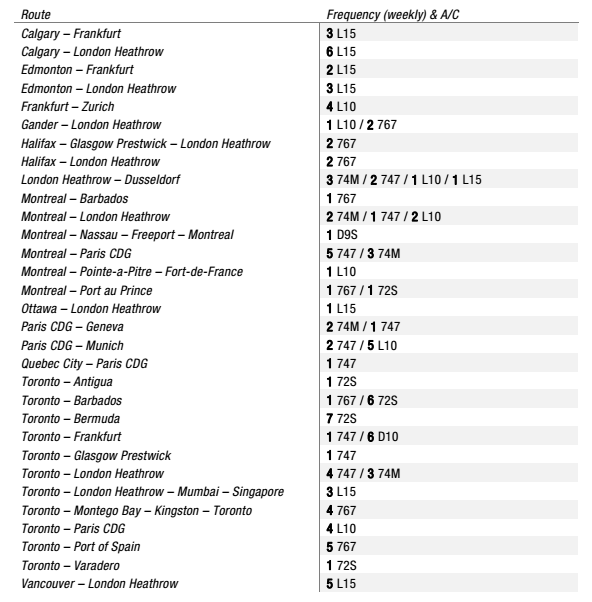 It shows Air Canada's International route network from 1985. The route that I found the most interesting was the old Toronto-London-Mumbai-Singapore route. I remember seeing this on the route maps from back then I thought what an awesome routing that would be for those of us who are avgeeks! (That term wasn't around in 1985 but the premise behind is the same!) Check out the post here.